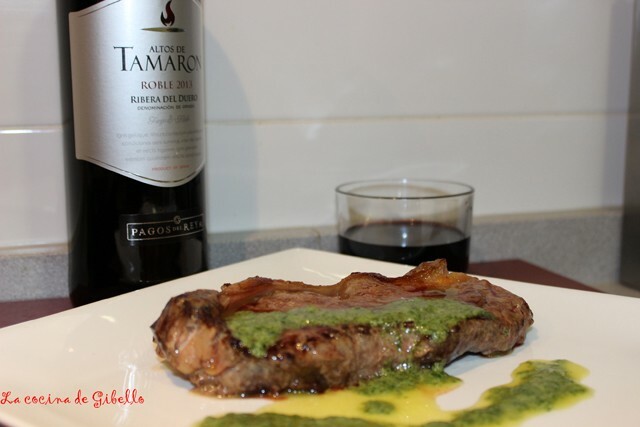 From the blog La Cocina de Gibelo, its author, David Gibello recommends this recipe to be enjoyed with Altos de Tamaron roble, a perfect wine to taste with high quality red meat dishes. Enjoy this easy and exquisite recipe. Make the persil sauce. Mic all the ingredients together and mince them. Pepper and salt can be added as preferred by us. The last ingredient to be added is olive oil and we keep apart while we cook the steak. In a pan, we put a spoon of olive oil and we heat it. Place the steak for approximately 3 and half minutes at each side. Serve in a plate and add the persil sauce. Recommended with Altos de Tamaron Roble, a wine with an intense cherry colour and violet reflections. Rich aromas of cherries, prunes, and red berries with fine hints of toasted coffee and chocolate. The taste is fruity and soft, with pleasant hint of vanilla and a nice persistence.